The Honolulu Zoo's male baboon. The Honolulu Zoo holds a special place in my heart. Zoos around the world have always had a pull on me. I remember going to the HUGE San Francisco Zoo for the first time and seeing wolves – my absolute favorite animal. I visited Oregon’s zoo many, many times during college because walking around their layout was a blast. Crisp, cold air, hot coffee and a slow walk? Can’t get much better than that. After college, my tastes ran toward the more ethical safaris and animal-eco tours (Surin Project, anyone?). What makes the Honolulu Zoo memorable for me is that I’ve been going here since I was a little girl. The zoo has gone through some major renovation changes over the years, but what makes it really neat is that it is the perfect place to have a picnic in crowded Waikiki and enjoy a large lawn, plenty of seating, lots of shade and a beautiful walk adorned with native trees, plants, flowers and of course, animals! You can save some major bucks with the Go Oahu Card by combining several Oahu activities for one price. If you’re on Maui and won’t be visiting Oahu anytime soon, take a look at the Maui Value Pass that sea lovers will enjoy. It combines four awesome activities that will educate you on our sea life and plantation history. Considering that it’s in crowded Waikiki and right across from Waikiki beach, it’s pretty amazing that the Honolulu Zoo manages to feel like a large park with several attractions and beautiful gardens. I grew up with the “old” zoo that had your standard zoo animals and architecture. I recently revisited Honolulu Zoo and they’ve really updated the whole park. Where else can you see a giraffe and Diamond Head together? The Honolulu Zoo is now much more pleasant and enjoyable now. 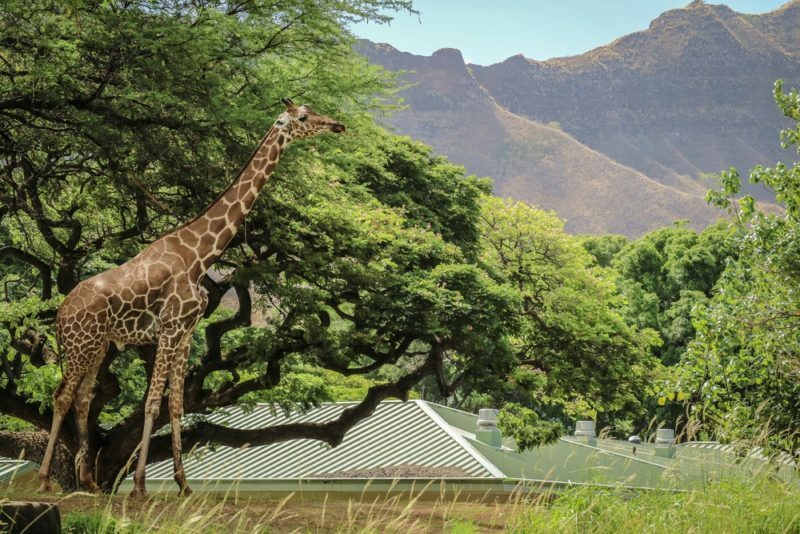 It wasn’t just the animals and their enclosures, but also the architecture, the huge increase in tropical and native trees and plants and the beautiful grounds that really added to the whole Hawaii zoo experience. Before, the Honolulu Zoo had a set path that everyone followed to see the animals. But now, it’s an experience for the family to wander and get lost, which is really rare these days. Now you can walk through lawns, go “backward” or even skip enclosures and return to them later without causing a traffic jam. 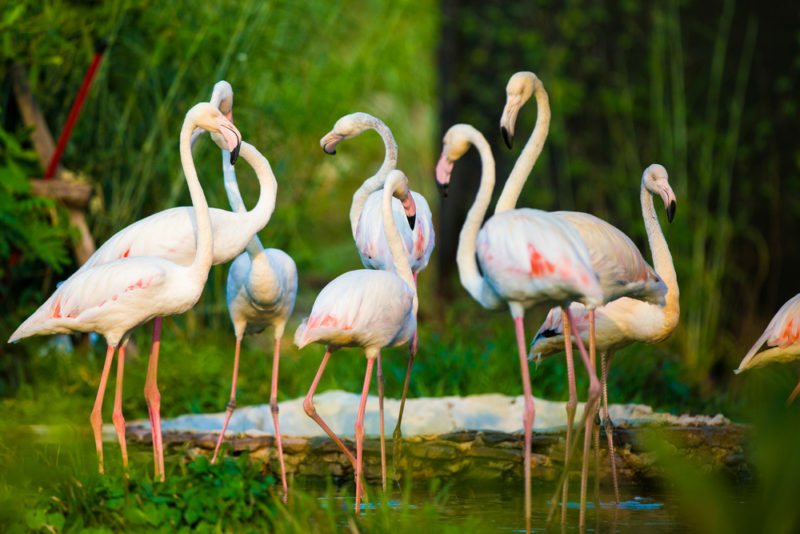 Ever since I can remember, seeing the flamingos was always an awesome sight. They’re right in the beginning to greet visitors. The Honolulu Zoo is an awesome place to have a picnic! They encourage you to bring your own food and drinks and enjoy a peaceful day on their beautiful grounds. There is plenty of grass, shade and benches and kids have the time of their lives jumping on the animal-shaped rocks. In fact, it’s easy to use your picnic area as a base, while everyone takes turns exploring each animal enclosure. Note: the Honolulu Zoo also sells their own food and has an eating area, which is fine if you don’t mind the prices. The Honolulu Zoo doesn’t just have random trees and plants throughout the zoo. They’ve chosen a large selection of native and tropical plants that flourish in Hawaii AND have labeled them so you know what you’re looking at! It’s actually one of the more interesting displays of the zoo and it runs through the whole area. What Kind Of Animals Are At The Honolulu Zoo? 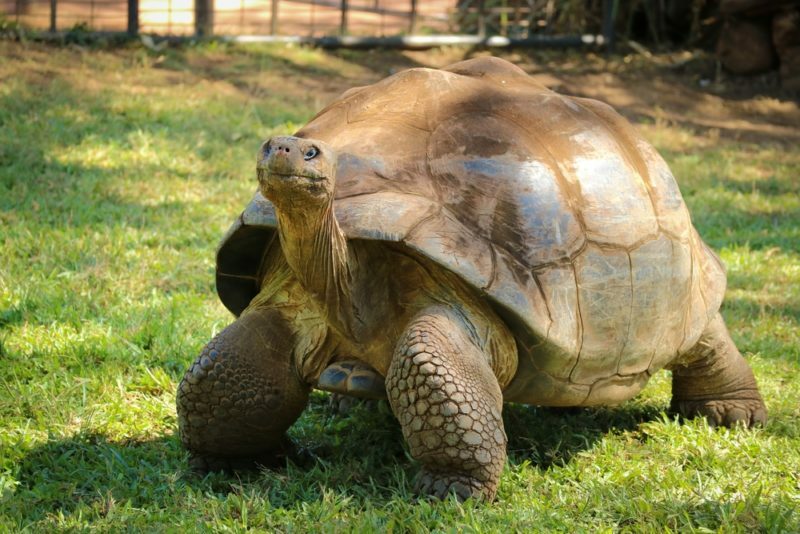 There’s actually a pretty extensive variety of animals that live at the Honolulu Zoo. Birds, reptiles, mammals and amphibians of all shapes and colors call Hawaii home. Plus, the Honolulu Zoo also has many native Hawaiian animals as well! Nene Goose – very rarely seen on Oahu, but more common on the other Hawaiian Islands. Pueo – The Hawaiian owl is a very magical creature to witness. The best place to see them is on the Big Island in my opinion. Koloa Maoli – This endangered Hawaiian duck is similar to a mallard and can be most commonly found in protected areas of Hawaii. Unfortunately, its numbers is still decreasing. 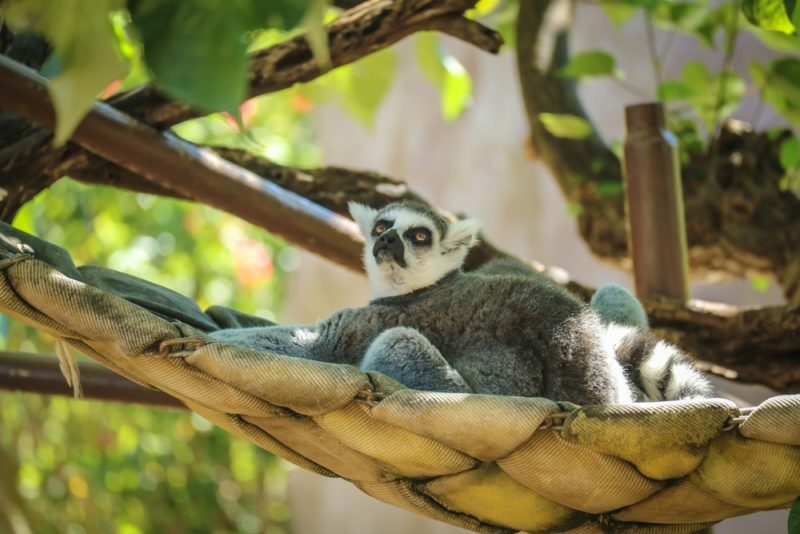 Besides doing the “normal” day time admission, the Honolulu Zoo holds several musical and evening events that might fit your schedule and interests while here. The Wildest Show In Town – During the summer from June thru August, the Honolulu Zoo and Roy Sakuma (crazy-famous local ukulele teacher) team up and hosts evening performances featuring local artists and bands. And it’s only $5! 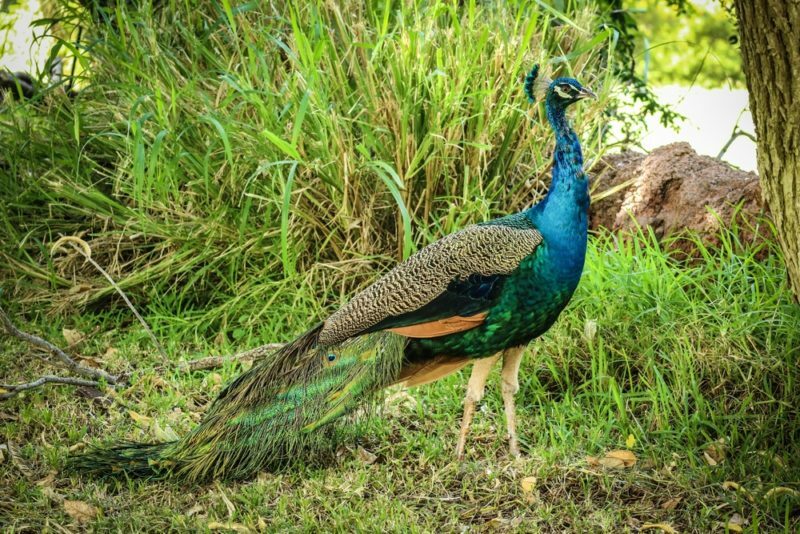 Twilight Tours – On the weekends, the Honolulu Zoo offers evening tours where you get to see the animals in a different light as the day darkens. 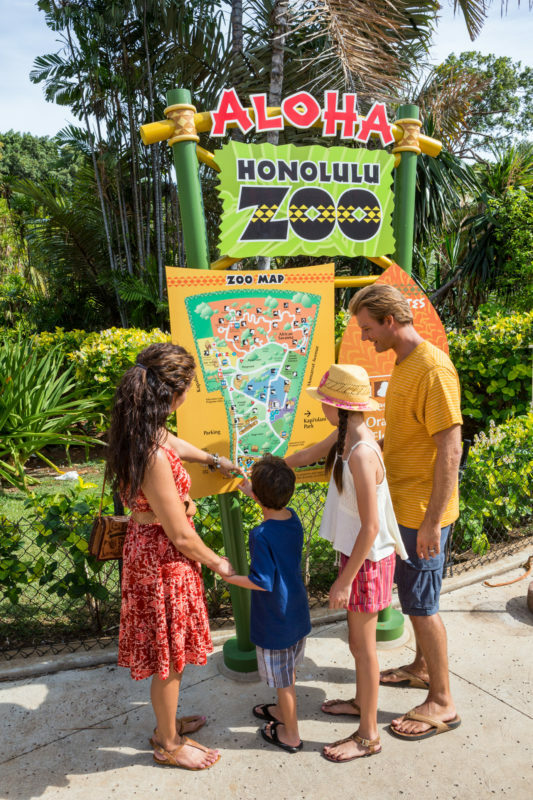 The Honolulu Zoo also has many other options such as birthday/event parties, field trips and even bringing the zoo to you. You can find out more about all of these special events at the Honolulu Zoo website. A bigger zoo with more space to dedicate to animal enclosures is always going to be better. 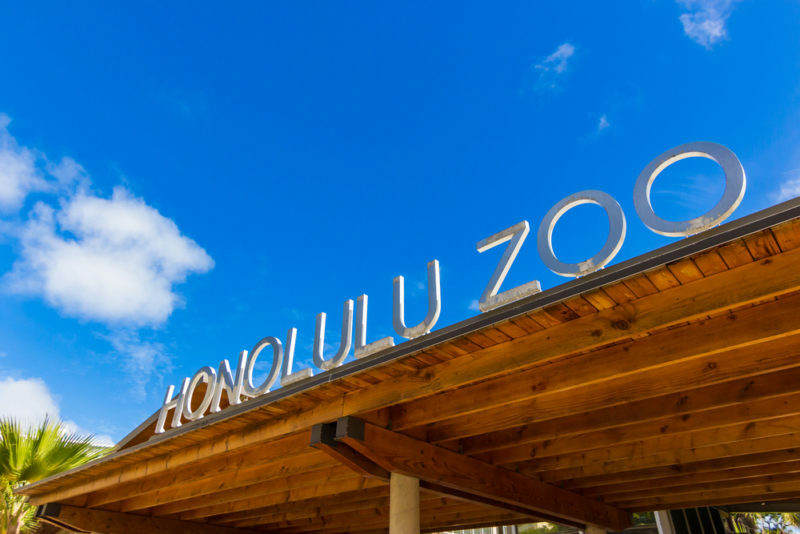 But unfortunately, space is an expensive commodity in Hawaii and there is really nowhere that the Honolulu Zoo can expand to since it’s right between the Waikiki strip, Kapiolani park and the beach. However, I feel that with the latest renovation, they’ve done a good job in using Hawaii’s good weather to their advantage. There are plenty of trees to provide shade and the zoo has an open air feel to it so that the whole park has that natural vibe and overall just feels larger than it is. 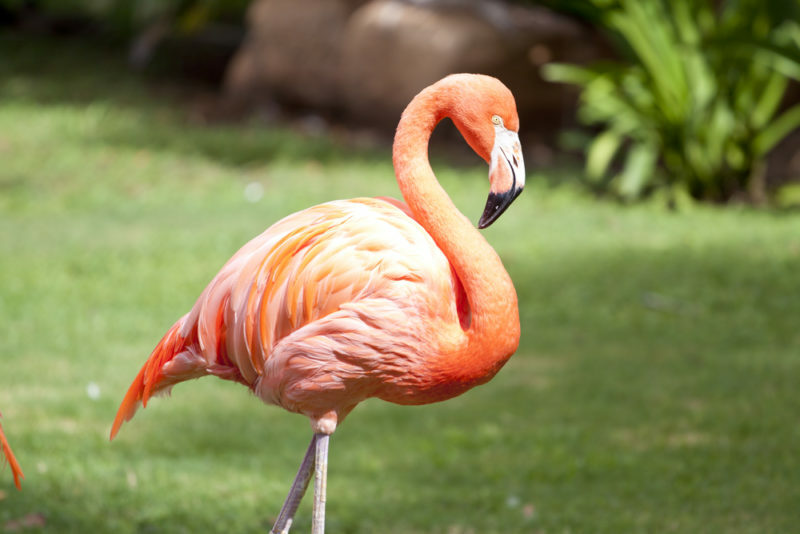 Of course, the zoo is tiny compared to the San Diego Zoo or African safaris, but as a place for children to be inspired and for people all over the world visiting Hawaii to learn more about wildlife, I think the Honolulu Zoo accomplishes this to a certain degree. Compared to what I’ve seen in other exceptional zoos in my travels, I think they could do better, but they’re on the right track with the improvements that have been done so far. No cages for the peacocks! These guys walk free. My favorite part of the Honolulu Zoo as an adult was not the animals surprisingly. Instead, it was the beautiful greenery that was planted throughout the park. In Hawaii, you may notice that in some parks, gardens and hotels, they’ll have each plant and tree on the grounds labeled for the viewer’s convenience. The Honolulu Zoo does this as well and they’ve planted an abundance of trees, flowers and plants from around the world and indigenous to Hawaii. The amount of greenery here was a joyride for my eyes and it makes the whole zoo experience that much more fun because you feel like you’re walking through nature even though you’re smack dab in the middle of Waikiki. 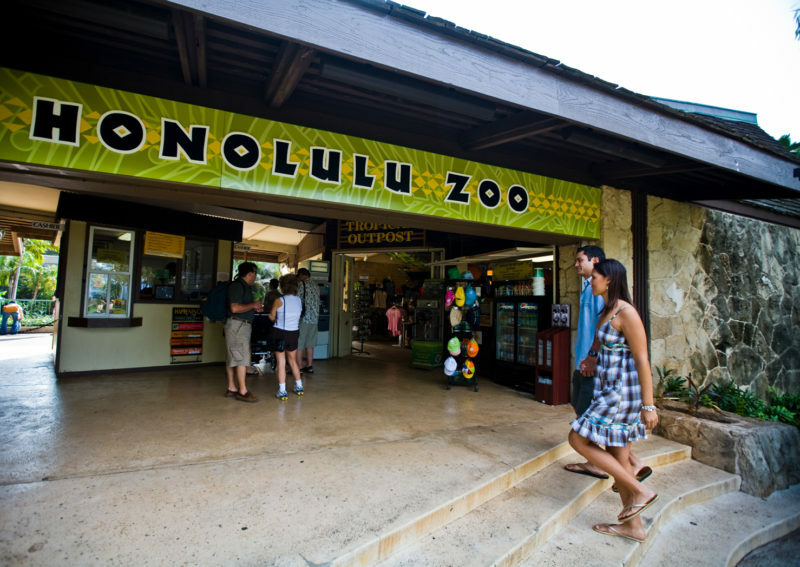 Who Should Go To The Honolulu Zoo? 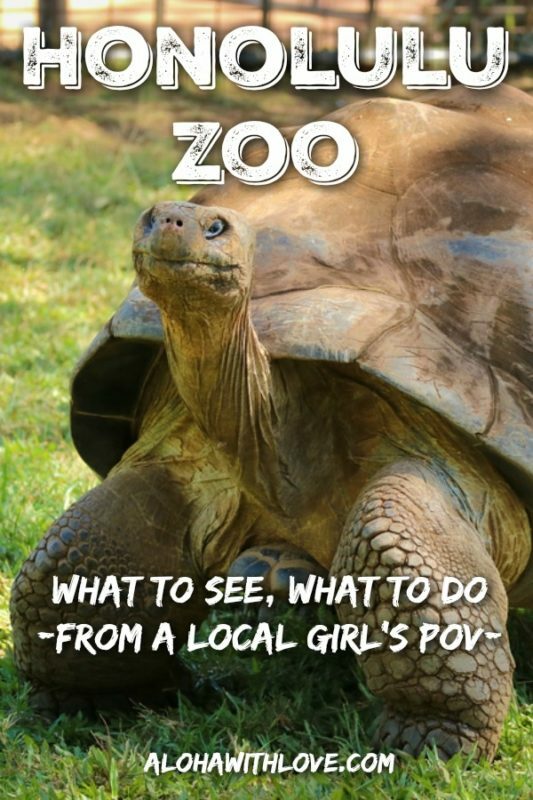 So, should you go to Honolulu Zoo? If you have young kids and are looking for something educational to do together, I’d say yes. The zoo is different from anything else on Hawaii and the animals and beautiful grounds will be fun for both kids and adults. If you have some time to spare before your flight out and are all beached out, I would also recommend the zoo (or the aquarium) because you’ll be spending your last few hours in Hawaii outdoors with some great scenery. The zoo is also a great choice for older people since they’ll get to move at their own pace and can sit down if they need to rest. There’s a nice eating area with plenty of tables and shade, but note that it can get crowded during lunch time. On the other hand, if your stay in Hawaii is short or you’re trying to decide if you should squeeze the zoo into your already crowded itinerary, I’d say pass on the zoo and spend the time on that surf lesson or ATV off-road sightseeing tour you were considering.